Pastor Ricky Scaparo, of Ricky Scaparo Ministries and End Time Headlines, has been a pastor for several years, his postings have attracted upwards of 481k followers on Facebook alone. However, Pastor Ricky has detailed to The Christian Journal that Facebook censorship has potentially engulfed his page. Online ministries have exploded with the help of Social Media Giants like Facebook; however, what happens when the social media giant decides that it doesn’t like your content or disagrees with your faith? Pastor Ricky Scaparo is the owner of End Time Headlines (ETH), a massively popular Facebook page with over 481,000 likes and nearly 460,000 followers. The ministry, ETH, was launched in 2010 with the intent to equip believers in understanding the times and the changing of seasons. Unlike many other End Time or Prophetic Ministries, Pastor Ricky does not set dates or sell products. Instead, the Ministry is solely to equip believers for discerning the changing of seasons. End Time Headlines, the website, houses thousands of posts about the news from various sources all over the web, many of which come directly from mainstream media. Pastor Ricky has said that the ETH website is sort of like the Drudge of Christian News. Upon browsing the site, you’ll see that each post is roughly a paragraph describing the source link of the article where the reader can choose to read on or find another post to browse. ETH, the Facebook page, houses many of those same links as well as broadcasts, uplifting pictures and scriptures as well as memes too. Starting out Pastor Ricky’s broadcasts reached thousands upon thousands of people. However, starting today out of 481k people Pastor Ricky is only reaching eleven. 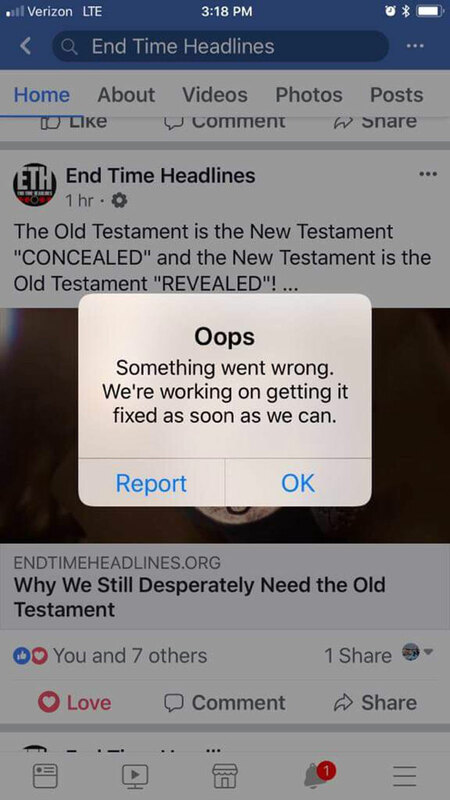 In addition to the unbelievable drop in viewership, error messages have been posted to the Pastor’s followers that read; “Oops, Something went wrong. 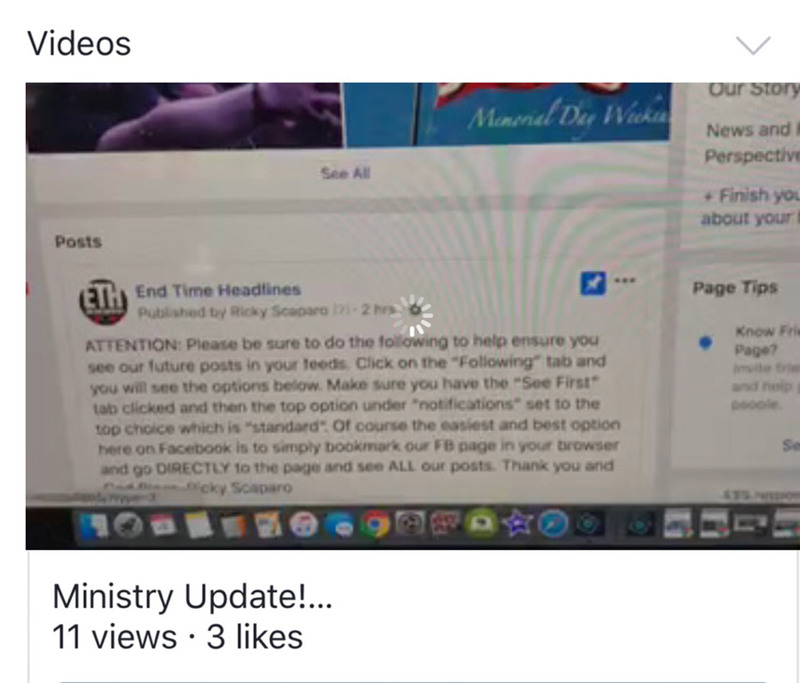 We’re working on getting it fixed as soon as we can.” Pastor Ricky has previously informed his viewers and readers to set their notifications from his page to “see first,” meaning that the Page’s posts should, as per Facebook guidelines, appear at the top of the News Feed. However, almost no one sees the respective posts. (Facebook) Oops, something went wrong – Strange error that Facebook is not explaining. According to the Pastor, his Facebook page is in good standing, and Pastor Ricky has not received any warnings about his content, no threats from the Social Media giant urging him to remove “controversial content.” The Pastor informed me that he has reached out to Facebook and requested an answer about what is going on. However, Facebook never responded. (Facebook) Another Ministry Posting yet again showing only reaching four people. 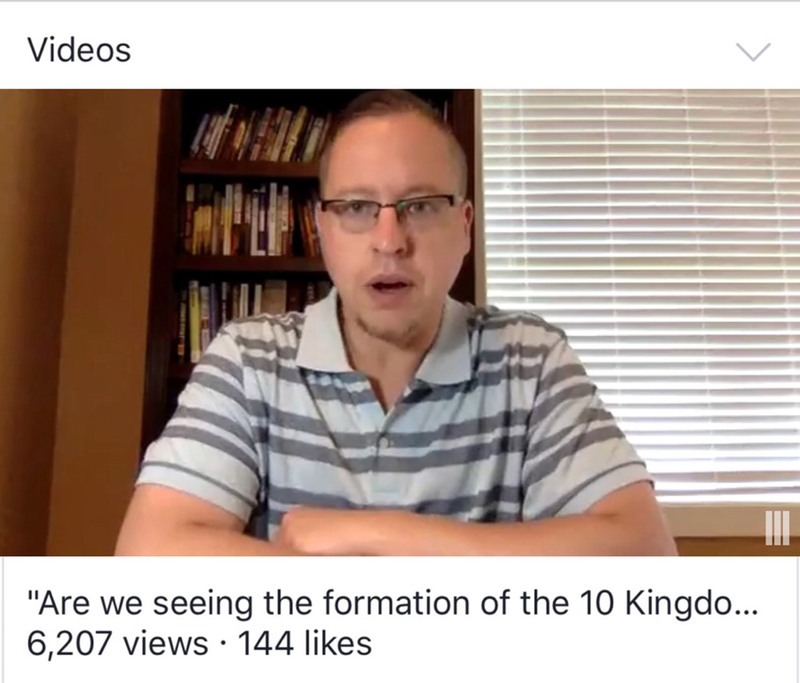 Incredibly, at the beginning of June the Pastor attempted to utilize Facebook’s advertising system to recapture some of the lost viewership as a result of the advertising, the Facebook Page, End Time Headlines, has received almost no likes and reached barely anyone yet Facebook is still taking his money. Upon further investigation, prior to May 31st, 2018, Facebook Page posts from ETH were being shared on average roughly 100-200+ times per post. However, after June 1st, 2018, almost at the stroke of midnight, page posts are barely being share ten times. 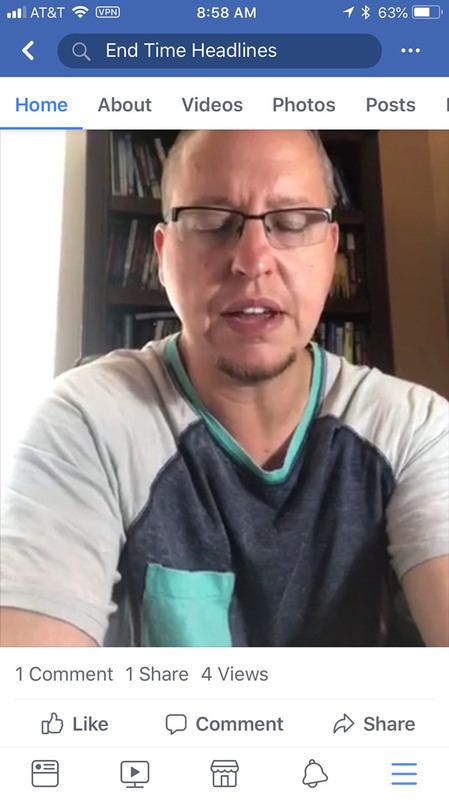 As of June 4th, 2018 Pastor Ricky is also having trouble live streaming videos. One of the videos he livestreamed about the problem is unable to be viewed by anyone as if Facebook is blocking his ability to live stream as well. Facebook in recent months has garnered the label of ‘Anti-Christian’ because Pastor Ricky is one of several people who happen to be Christian or Conservative that are suffering similar fates at the hands of the Social Media Giant. 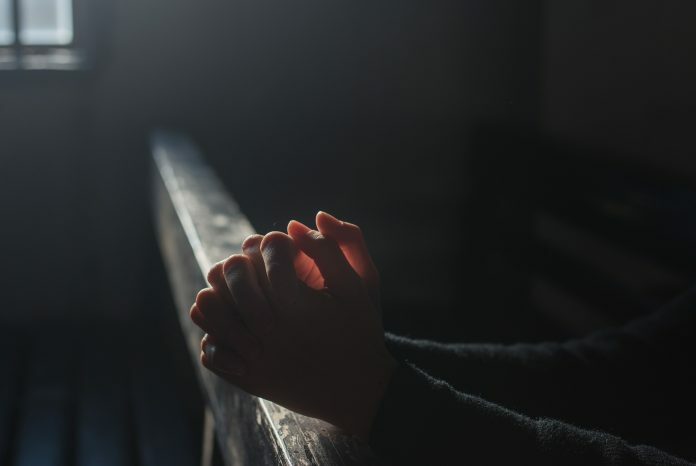 Facebook is one of many platforms that are conducting similar forms of censorship against Christians and Conservatives; another is YouTube where Christian channels are being deemed secretly “offensive” and either banned from reaching their audiences or deleted wholesale. The occurrences are so frequent and significant that Prager University, stringent Conservative YouTube channel with almost 1.5 million followers, is in the process of filing a lawsuit against the Social Media Giant.